My wife, Susan, designed and we built a handy TP holder and shelf to fit in the space between the shower and sink in our 2350. Took some fitting since the walls are curved, but it is tightly wedged in place and required no screws to hold it. That is a terrific idea! We did extend the countertop over on ours and attached a toilet paper holder underneath which is helpful. We got the same material from the company that the countertop was made of to do it. This idea gives some much needed storage as well. Great job! 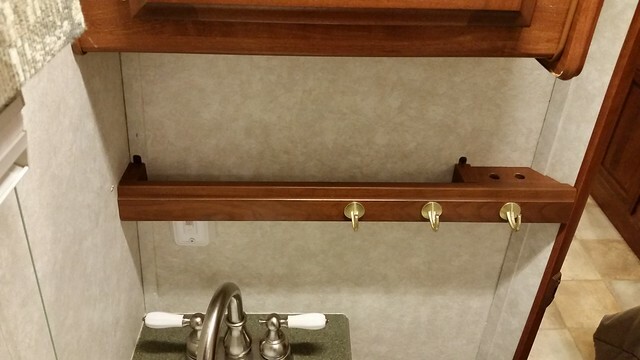 Shelf for tooth brushes, tooth paste, pump soap, hand lotion, and hooks for wash cloths. It keeps the counter clear and everything stays in place while driving. That looks good, maybe another project for us!